On with the saga of the peaches. You see, when I made the Poached Peach Tarts, I only used two of the peaches, leaving a good 6-8 left for more yummies. Mikal ended up eating a few, leaving me with four by the time I set down for my next project. You see, I had originally wanted to make Mason Jar Lid Pies – individually sized, relatively easy to eat, and all around pretty awesome looking. How could you say no to that? I won’t be for very long, that’s for sure. But I had a good amount of Danish pastry dough left, so my vote for the moment was on continuing with that dough so as not to waste it. Lucky for me, Sally’s Baking Addiction came to the rescue with her Danish Pastry Dough recipe, and handily had the how-to for a braided pastry. I did take the Spiced Peach filling from the above recipe, though, because it sounded just delicious. This being a Danish, though, I still added cream cheese with just a bit of a twist. Thinly slice peaches and combine with ground ginger, cinnamon, lemon juice, flour and sugar. Set aside. Combine cream cheese with an appropriate amount of peach syrup. What is an appropriate amount? That is up to you. Just make sure it integrates well. Remove chilled pastry dough from fridge, and roll out into a 9×15-inch rectangle (or however large you would like it). Mentally divide the dough into thirds lengthwise, and spread cream cheese mixture over central section in an even swath. Take peach slices and distribute them evenly over the cream cheese swath, in whatever pattern or layout you deem necessary. Just be sure to keep the overlap height consistent so you don’t have a lumpy pastry. In the remaining pastry areas, slice dough into strips at a 45° angle from the center swath, and mirror this on the other side. Starting at the top (where top means the point of the arrow the angular slits are pointing to), fold one strip at a time across the filling, alternating sides to create a braided visual effect. As you get closer to the bottom, you may have excess dough leading off the filling; fold this into the dough at the end of the pastry to create something of a pocket to keep the juices in. Fold in any excess dough at the top of the pastry in a similar fashion. Coat outside of pastry dough with egg wash, then bake the pastry for 16-19 minutes, rotating pan as needed to ensure even cooking. (I just found out in baking this that my oven has hot zones. Hadn’t really noticed it before, but then I don’t usually bake this large of items. Will have to observe in the future.) Cool pastry and consume. Mikal loves fruit. Any type of fruit – stone fruit, berry fruit, fruity fruit fruit-fruit. Blueberries are his favorite (and he can have them all), but peaches are a very close second. So when Sprouts had them on a good sale, he bought a bunch and demanded (not in so many words, but it was still a demand) that I make them into something scrumptious. Not one to take such things lightly, I immediately remembered some items on Pinterest I had found that might fit the bill. He also stated that it would be something would not be sharing with others. I thought this to be a bit unfair, but that’s ok.
My grandparents came up for the weekend on their way to Santa Cruz, and as a little thing we decided to make dinner. After all, they always make amazing food for us – why not return the favor? Mikal decided to dig out the turkey that has made its home in our freezer for entirely too long (we keep going to other peoples’ houses for holidays, so we haven’t had the opportunity to make it) and made an amazing slow-roasted turkey breast with roasted potatoes and carrots, and it was quite the hit. Turned out absolutely beautifully. It was also ready around lunch time, and you don’t really have that and something else in the same day – just seems wrong. So I tried to figure out a dessert to go along with it. Mikal was kind enough to proffer some of the peaches and suggested trying to make those pastries with the half-peaches and stuff. I had a vague idea of what he was talking about, but not having had one I wasn’t 100% sure, so I looked up some images and found that one version called it a Danish. Sounds about right. So I looked up how to make Danish pastry dough, because that was a bit new. Pretty easy, though you do have to let it chill for quite a while, at least a couple of hours, to make sure you plan ahead. I wasn’t quite sure what to do with the filling, though, and looked up how to poach a peach. Found a wonderful recipe from the BBC for vanilla poached peaches, and decided that was the perfect thing to do. So the below is quite the lengthy recipe, and unfortunately doesn’t have any pictures , but it was very well-received and AMAZING. One thing to keep in mind – I only used half or so of the dough generated below to make the tarts (total of four). The other half will be used for Peach Danish Braids (link to come). Whisk the yeast and warm water together in a large bowl. Allow to sit for 3 minutes until foamy. Add milk, egg, granulated sugar, and salt. Once these wet ingredients are mixed together, set the bowl aside and make your butter/flour mixture. Cut butter into 1/4″ cubes and add to the butter, cutting together until it is fairly crumbled. Pour flour mixture into the wet ingredients. Very gently fold the two mixtures together. Fold just until the dry ingredients are moistened to maintain a tender dough. The butter must remain in pieces, which creates the flaky pastry. Turn the dough out onto a large piece of plastic wrap. Wrap the dough up tightly and refrigerate for at least 4hrs or overnight. After 4-12hrs, take the dough out of the refrigerator to begin the rolling and folding process. Flour a work surface, and roll the dough out into a rough rectangle. You will likely have to continue flouring as you roll as the dough will be sticky. Fold the dough together in three sections like a letter, then roll out into another rectangle. Repeat once more. After the third folding together, wrap tightly in plastic wrap and stick back in the fridge for at least 30 minutes, or up to 1 day. In the mean time, prepare the peaches. Blanching: Put the kettle on, and fill a large bowl with iced water. Place the peaches in another large bowl and pour over enough boiling water to cover. Leave for 30 seconds, then remove the peaches with a slotted spoon and plunge them into the cold water. The skins should now come away easily. Cut peaches in half and remove pits, and set aside. Place the wine, honey, and vanilla pod in a pan large enough to hold all the peaches, then gently heat until the honey has dissolved. Lower the peaches into the pan, cover and simmer gently for 15-20 minutes until tender but not overly soft. Remove the cooked peaches from the pan and set aside. Boil the syrup hard until it has reduced by half, about 10 minutes. Set aside. After at least 30 minutes, preheat the oven to 400°F. Remove the dough from the fridge and cut in half. Wrap one half up and return to the refrigerator. Roll out the dough into a large rectangle, approximately 8×12 inches or so – large enough to get sizable squares of dough for the peaches to sit on and have a bit of a lip to roll. Cut out the dough squares and place onto baking sheet. 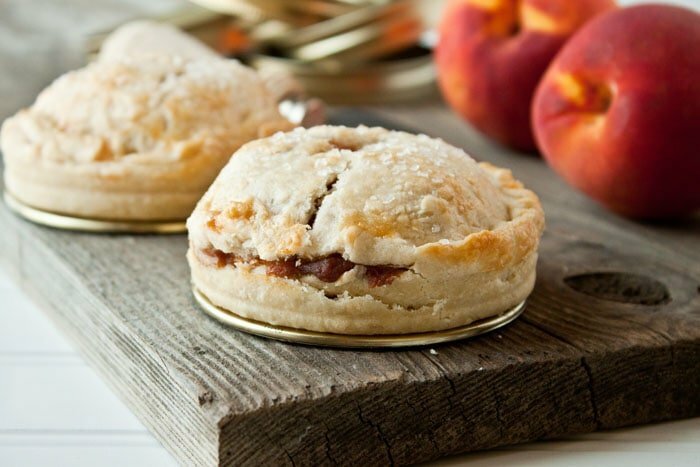 Place the half-peaches in the centers of the squares, then roll or fold the edges of the pastry up to create a lip. Pour 1 tsp of syrup over the peach, and coat the pastry dough with egg wash. Repeat process for each square. Bake for 15-18 minutes, rotating as needed for even baking. Remove from oven and let cool slightly. Serve with whipped cream, ice cream, crème fraîche, or alone with a bit more syrup drizzled over it. I have pretty much always had a love-hate relationship with pomegranates. I love how they look, how they taste, and how mess-less the actual meat of the fruit is; I absolutely hate trying to get the fruit out. I can have all the patience in the world with unknotting yarn skeins that have been given to kittens and take hours, but I hate picking pomegranate seeds from the fruit. Absolutely no patience for it. So I really haven’t had all that much pomegranate, which is rather unfortunate. I recently came across a Pinterest pin that described soaking a pomegranate to get the seeds out: the lining absorbs so much water that it actually pushes the seeds away from itself, making it a million times easier to get at them. I haven’t tried it myself yet, but you know I will. In the mean time, I found another pin for pomegranate scones. They look so pretty! I don’t know about the seed-parts of the seeds, but it seemed like a good idea. Unfortunately, there are no pomegranates in sight at the moment, and I’m too lazy to go to the store this morning for them. Luckily, I have some pomegranate syrup from my birthday not-cake, an apple-pomegranate tarte tatin. You’ll be seeing that up here eventually because it was super-amazing. Below is a variation of the recipe from the pin I found, substituting some things here and there. They turned out amazing, by the way. Don’t take my word for it. Just try it – you’ll see. Bring 3 cups pure pomegranate juice to a boil on the stove and reduce until a scant 1 cup . Chill 1hr. Take cold butter and either chop into 1/8″ cubes, or grate with a cheese grater. (I personally have not had luck with the cheese grater option – it’s messy and a lot ends up melting on your hands by the time it’s finished. That being said, there are a lot of people who swear by that technique.) Place back in fridge while prepping other ingredients. Blend flour, sugar, baking powder, baking soda and salt in a bowl with a whisk until combined. In a small bowl, whisk the egg, then add half and half and 1/2 cup chilled pomegranate syrup. Set aside. Cut chilled butter into the flour mixture using a pastry blender or your fingertips until it resembles coarse crumbs. Add egg mixture and gently mix together until it comes together. Turn the dough out onto a floured surface and roll or pat out to a desired thickness. From here, the possibilities abound: you can go the traditional scone route and form the dough into a circle then cut into wedges; you can also roll it out and use cookie cutters, which I find to be SO FUN. I mean, I can make pumpkin-shaped pumpkin scones for crying out loud. Once scones are shaped, place 1″ apart on baking sheet in the freezer while oven preheats to 400°F. Bake for 15-17 minutes, until golden on top. Cool on wire rack. In small bowl, add 1/4 cup powdered sugar to remaining 1/4 cup pomegranate syrup; whisk until blended. Add remaining powdered sugar to the mixture in 1/4 cup increments until it is all incorporated. If the glaze is thicker than you would prefer, add a tsp of water or vanilla to adjust consistency. Looks a little like blood, doesn’t it? Totally looks less like blood on close-up. I always get strange looks from people when I tell them I love baked goods with blueberries, but I cannot eat them fresh. They just don’t taste like blueberries to me, for some reason. The best logic I can come up with for it is that from the baked goods flavor and texture, I guess I expected blueberries to be sort of larger individual blackberry ball-things – you know, just full of juicy goodness with a bit of pulp. I am also pretty sure I didn’t have fresh blueberries until I was around 20ish years old. I honestly can’t remember having them before then, and to me, fresh blueberries just taste sort of fruity-grassy green, not like baked blueberries at all. Perhaps my tastebuds will change, and eventually I will find them desirable. Perhaps. Eventually. Until then, Mikal can have all the fresh blueberries that I don’t make into jam (will be doing that soon :D). Until I had these scones, I was kind of the opposite with strawberries – I could eat raw strawberries until the cows came home, but the thought of them cooked just turned me off. I mean, they get kinda slimy and they generally loose that tart goodness… It’s just not the same. I do make an exception for strawberry jam – it is cooked down, but it’s just a reduction of the amazing flavor of strawberries with the occasional chunk. Preserves are hit-or-miss for the same reason of slimyness. I have texture issues. So when my grandmother made these for breakfast one day while I was visiting her a few months ago, I was slightly ambivalent. I think I was less ambivalent because I have never not liked something my grandma made, at least not in the baked goods department. I really can’t remember anything she made that I didn’t like; interesting. (It’s strange what you don’t realize until you turn your mind to it.) At any rate, I reserved judgment while she was making them, and once they started making amazing smells in the oven – I tell you, I was hooked. I love scones, and I love the smell of them baking, and the strawberries lent just a bit of sweet fruitiness to the smell….. Oh, yes. And once they got to the table I ate way too many, especially considering there were eggs and bacon and something else she had made along with the scones. I had to get the recipe from her afterward – for that and for her key-lime pie. Preheat oven to 400°F and line a baking sheet with parchment. Cut the butter into small pieces and return to refrigerator. Whisk together the flour, sugar, baking powder and salt to combine. Add chilled butter and rub with your fingertips until butter is well distributed – it should look like coarse crumbs. Gently stir in the eggs and 1/3 cup heavy cream until the mixture forms a soft dough. Stir in the strawberries. Turn the dough out onto a lightly floured work surface and pat into a 1″ thick shape. From there you can cut your own triangles or use cookie cutters to achieve the shapes you would like – just make sure to not overwork the dough when you’re gathering the scraps to pat it out once more. Brush with the remaining heavy cream and dust with raw or granulated sugar, if desired. Bake until golden-brown, about 18-20 minutes. Serve warm. Eat one or two and then give the rest away so that you don’t eat the whole batch in one sitting. You’ll understand when you make them. This is when scrounging in the refrigerator comes into play. In the last few months, it seems that I have completely lost track of what we do or do not have in the fridge (outside of my half-and-half). It doesn’t help that the times I am looking in the fridge for a purpose outside of caffeination I don’t actually pay attention to what I’m seeing in the fridge unless I am looking for something specific – and with Mikal doing pretty much all of the cooking lately, my relationship with the fridge has become rather distant. Much to my delight, I found bananas in the fridge. Since I was thinking about the coffee cake anyway, I looked up banana coffee cake recipes. There are plenty of recipes out there, but the following one intrigued me. It’s not so much coffee cake – it doesn’t have that fluffy texture I tend to associate with coffee cake, and generally behaves more like a lemon bar, or something of that sort. I do recommend using a medium-to-large glass baking dish; I used one that is about 6×8.5 inches and the bottom layer was a bit on the thick side, and the bars took about twice as long to bake as expected. Even so, they tasted pretty amazing. Preheat oven to 350°F. In a large bowl, combine flour, sugar, brown sugar and butter and mix at low speed until crumbly. Press 1 1/2 cups of the crumb mixture into a 13×9 inch baking dish. Measure out another 1/2 cup crumbs and set aside. Combine remaining crumbs in mixing bowl with remaining ingredients. Beat on medium speed until well-blended. Pour evenly over crumb crust. Sprinkle reserved crumbs over top. Bake until golden brown, 30-35 minutes. Cool and cut into bars of whatever size you desire.